While waiting at the airport in Keflavik, Iceland for my plane to Copenhagen in October I bought a small storybook in Icelandic for my KIDLINK students back in Maryland. We cannot understand the Icelandic words but by looking at the pictures we tried to tell what the book is all about. We wrote to our friend, Lara, in Iceland and told her about our book. She wrote back with some hints. The name is "The animals at the farm." How do the kids like the book? They can write to Gisli Tryggvi and me if they like some translation of what is in the book. You can skip the comma over á é í ó ú ý and write æ as ae, and þ as th, and ð as d. We will understand it that way. I am Danielle. I go to Delmar Elementary. I am 11 years old. 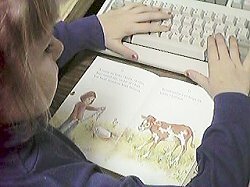 I am reading a book about a little girl that lives on a farm. 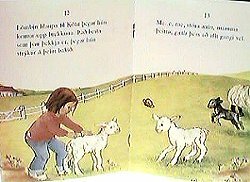 The name of the story is called the animals at the farm. I think it is about a girl that lives on a farm. It is very hard to read but with the pictures I understand what the story is about. Can you tell me what this word is mommu? On the first page I think it is Kata with corn in the bucket so she can feed the chickens, pigs, goats, and little chicks. >understand what the story is about. Can you tell me what this word is mommu. I am learning this in my Icelandic classes and am nearly finished. 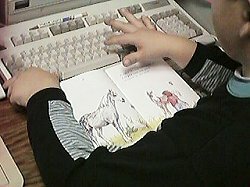 We are in the first grade and we looked at the pretty book from Iceland. It is about a little girl who lives on a farm. She saw the animals and she fed them. We could see baby chicks, baby puppies, baby pigs, baby lambs and baby kittens. We like your book. At farms in Icelands you can't grow corn to make bread, because it is to cold. We get the corn from other countries. I have gone to a farm very often we have a cottage on a farmland. I like best collecting stones. These are the little stories my students wrote telling about the pictures in the book. We had lots of fun trying to interpret the story. Kata was on the farm. She was feeding the horse and the animals. There are ducks and goats and there are flowers and puppies and a dog and a sheep and she feeds them and takes care of them and the pig and baby puppies. Kata was on the farm. She was feeding the duck. She was feeding the puppy. She was making a daisy chain on the farm. She was petting and holding the puppy. She was feeding the horse. Kata was on the farm. She was feeding the horse. She was feeding the chicks. She saw the dog. She is making a daisy chain. She was playing with the kittens. She was holding the puppy. She was feeding the goat. The dog ran to the girl . She was feeding the pig. The ducks were swimming. She was rubbing the lamb. Kata was on the farm. She fed the pig. She fed the duck. Kata was feeding the sheep too. She saw the puppy. She fed the goat. She made a daisy chain. The dog ran to Kata. She was feeding all the animals. Her dog had puppies. The end. Kata was on the farm. She was feeding the horse. She played with the kittens. She played with the goat. She played with the pig. The dog came to her. She was making a chain. She was feeding the chicks. The dog ran to the girl. The ducks were swimming in the lake. Sarah is on a farm, too. You might be interested to know that our animals have very old origin. They where moved here for over 1000 years ago and very rarely mixed with other animals of same sort. This means for example that our hourse is special, very strong and more like a pony but still it can carry a man that is over 100 kilo. It can do 4 ways of walking and the only horse that can do one of them. They have also special colors I am told is rare. The sheep has different whool also, tog and þel. That is long hairs and short curly one. That makes our whool light but warm. The lamb meat is also special since the lambs are sent to the mountains when they are pretty young and do not get any fixed food only the wild plants. But they at the same time create a huge environmental problem by eating almost everything in our vulnerable nature. That leeds to that the soil starts to blow and changes the earth to desert. So we have to learn better to control this.